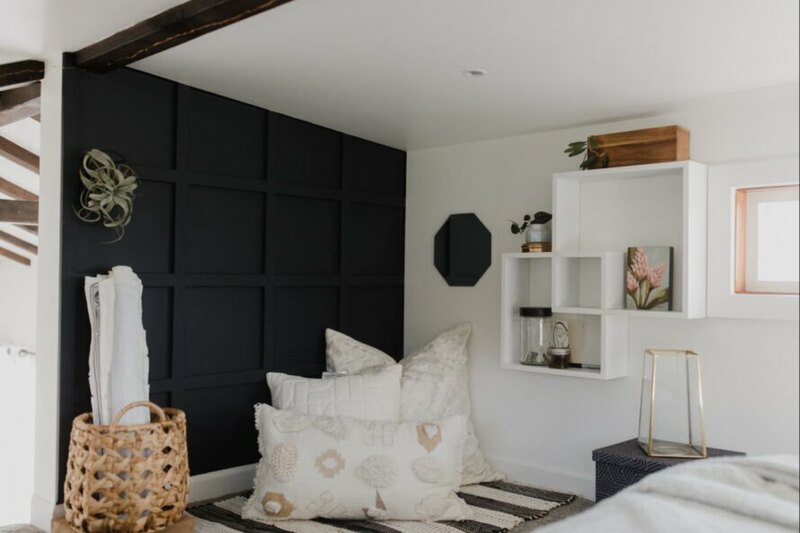 DIY home building is always an ambitious aspiration, but when it comes to building your own tiny home, it can be an entirely different beast. But that didn’t stop Maui natives Zeena and Shane Fontanilla from taking on the task to unbelievable results. The Fontanilla tiny home is 360 square feet of an incredible blend of beautiful design mixed with some impressive off-grid features such as solar power and a water catchment system that allows the family to use all of the rainwater that falls on the property to meet their water needs. The first step of the DIY home build for Zeena and Shane was designing their dream layout. 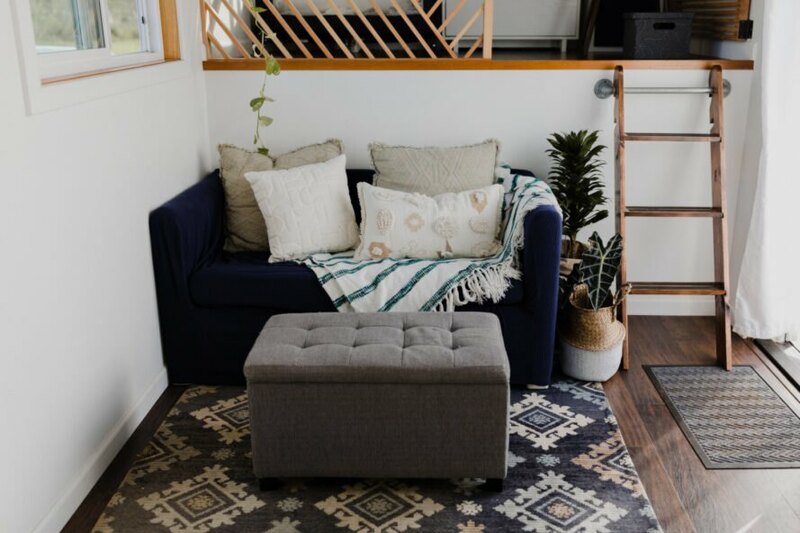 The next step was finding a trailer that would suit their desired floor plan, which is where they hit their first obstacle. After searching Craiglist and other sites, they couldn’t locate a trailer that would fit what they had in mind. Instead of changing their plans, they decided to build a customized trailer. From there, they cut their own timber to create the frame of the home. 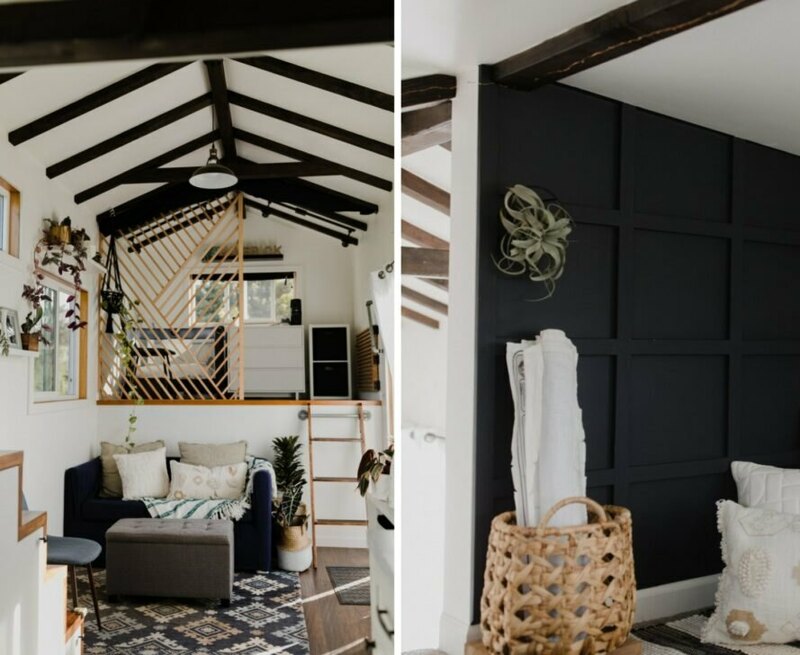 The couple took about two years of working nights and weekends to build the off-grid tiny home of their dreams. Located on an expansive lot of idyllic farmland, the final result is 360 square feet of customized living space, complete with a spacious living room and double sleeping lofts. The interior is light-filled with high ceilings. Plenty of windows, all-white walls and dark timber accents, such as exposed ceiling beams, make the home bright and modern. 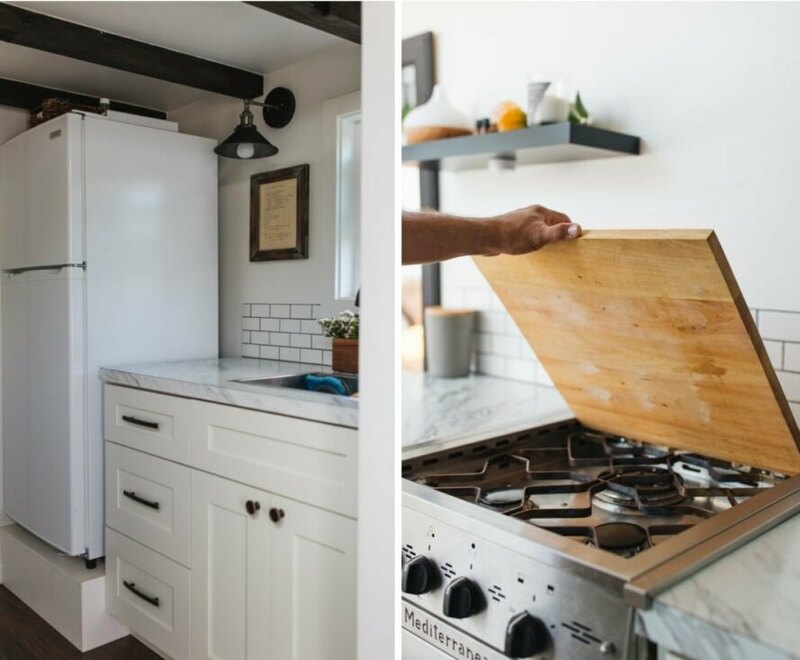 In addition to its beautiful aesthetic, the tiny home operates completely off the grid. A solar array generates enough power for the family’s electricity needs. 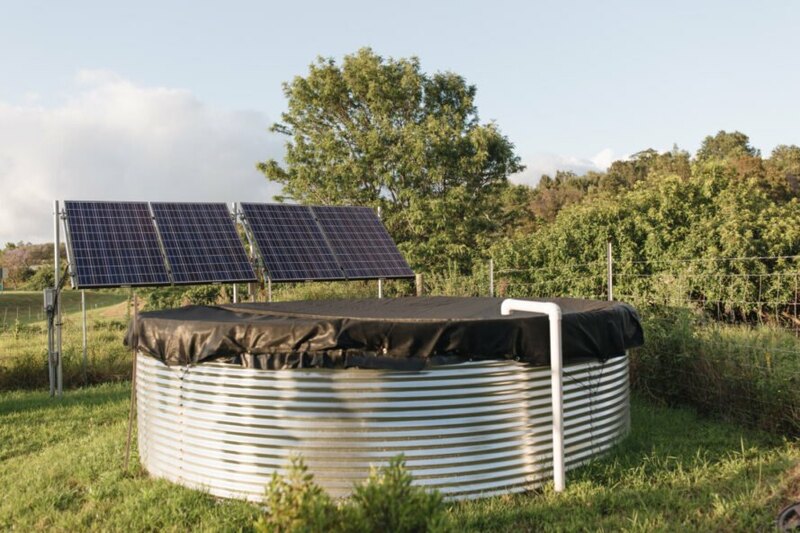 Additionally, a custom-made, 3,000-gallon water catchment system allows the family to use the water that falls on the property to fulfill the family’s water usage. To reduce energy use, the home is also equipped with energy-efficient appliances and a waterless composting toilet. You can keep up with the Fontanilla family’s tiny home living adventures on their Instagram page. Zeena and Shane Fontanilla built a 360-square-foot tiny home for three in Maui. The home boasts a beautiful interior design. Thanks to the pitched roof, the interior has room for dual sleeping lofts. The home was custom-built to the couple's specifications. All-white walls and dark timber accents create a striking contrast. The home is completely customized to comfortably fit the family of three. An abundance of windows flood the interior with natural light. A large solar array generates enough energy to meet the family's needs. 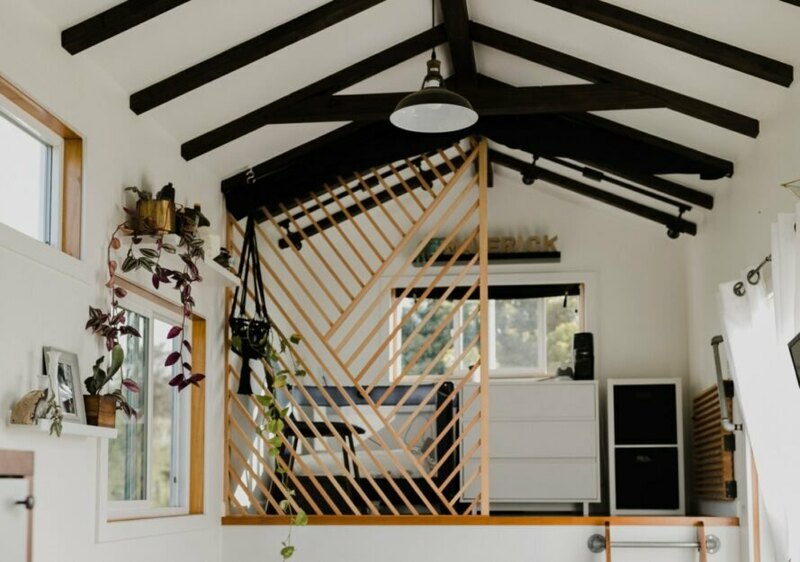 Thanks to solar panels and the large water catchment tank, the tiny home runs off the grid. 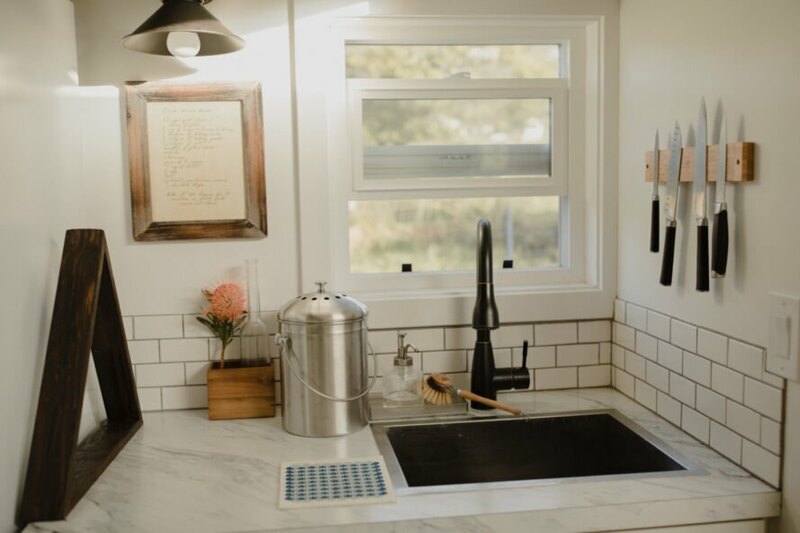 DIY home building is always an ambitious aspiration, but when it comes to building your own tiny home, it can be an entirely different beast. But that didn't stop Maui natives Zeena and Shane Fontanilla from taking on the task to unbelievable results. The Fontanilla tiny home is 360 square feet of an incredible blend of beautiful design mixed with some impressive off-grid features such as solar power and a water catchment system that allows the family to use all of the rainwater that falls on the property to meet their water needs.